The Gop temple is one of the oldest stone temples of Gujarat in Western India. It was built in late 6th or early 7th century. Located in the Jamnagar district it has Gandhara architecture with a square shrine. Surrounded by double courtyards it has a unique shikhara. It is on the bank of Vartu river, south-west of Gop Hill of Barda Hills. The art is a blend of Gandhara and north Indian Gupta art styles, including Kushana influence. Gop temple, north west view, image,1874. The walls of the temple do not have any carvings, the shrine faces east like many temples in India. The shikhara is like a pyramid. The temple rests on a jagati with a projection on the east but is otherwise square. There are three dormer windows called chandrasala which are on the slopes of the shikhara. This temple was built by the Maitraka dynasty which was ruling Saurastra during the time. The Maitrakas came to power after the fall of the Guptas and are believed to have built over one hundred temples in the region.The Maitrakas ruled for over 250 years and are known to have given many grants for the construction of religious buildings. Their capital was Valabhi, an ancient sea port linking India with Persia and Europe. The Chinese traveller Hsuen -Tsang visited Valabhi in 640 A.D, the ancient capital of the Maitrakas. Large heavy blocks of stone have been used for the construction of the temple. There might have been steps to take the devotee to the entrance of the temple. The temple has been built without any cementing material. It is made of coursed ashlar which are 8 inches deep and jointed. The shikhara is made of six courses with one slab covering the apex with an amalaka on it. The dormer arches or chaitya windows of the shikhara in two tiers had sculptures of gods and a figure of Ganesha is still seen on the temple’s west side. The holes which might have supported beams to hold the roof of the first inner courtyard can be seen clearly. The courtyards served as pradakshinapatha or circum-ambulatory path for the devotees. The yellow stone deities inside of the shrine are Lord Rama with a high square mukuta or crown and Lakshmana with a lower crown, believed locally by people in the area. The art of ancient India/Huntington,Susan,New York : Weatherhill,1985. 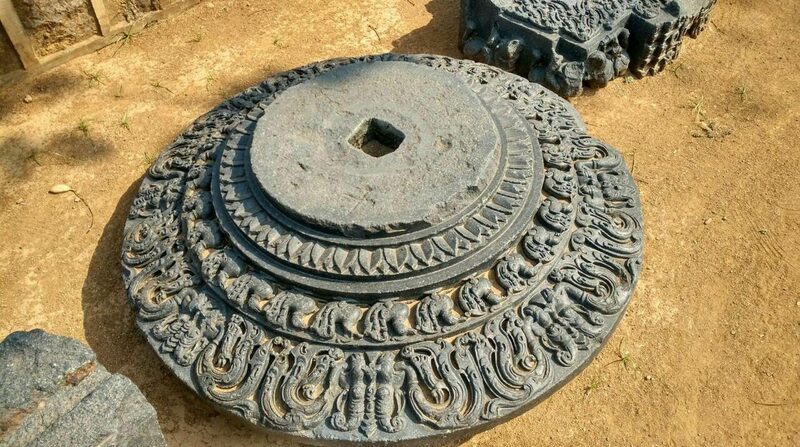 This entry was posted in Ancient Indian history, art history, art history of India, asian art, Gop, Gujarat, Gupta art, Maitraka art, sculpture of india, Temples of India and tagged Gop, Gupta art, Maitrakas, sculpture, Temples on July 18, 2017 by historyreads.